Did you know Jefferson has a Food Bank? We Do!!! We collect food throughout the year and distribute it in backpacks each Friday to Jefferson families who are in financial situations that places them in need of additional support from their community. Jefferson PTA and School Staff appreciate all of your donations and support. THANK YOU to everyone who donates to this amazing cause! ​Jefferson Elementary PTA operates a food bank and weekend backpack program for families identified as needing support by staff and counselors at the school. We have approximately 40% of families in our school who qualify as low income by state standards including some families who are currently homeless. We have about 25 families identified for the program this year and over half of them are homeless or displaced. So, your donations will be greatly appreciated throughout the year. Backpacks will start going out starting October 5th. They will be sent home EVERY Friday as long as we have the supplies to do so. The program is completely confidential – families in need of support can contact Ms Ortiz-Self through the front desk and the identity of families receiving support is confidential. The PTA receives only the family size and approximate ages of children to prepare appropriate packages which are distributed each Friday. Many of you have already donated to this worthwhile cause. For that we send out a huge THANK YOU!! What do I donate and where do I put it? Amazon Smile and Wish List! 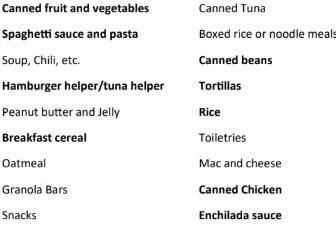 Did you know that you can purchase some food bank needs through Jefferson PTA’s Amazon Wish List and have it directly delivered to the school? And if you order through Smile.Amazon.com, and have Jefferson PTA listed as your charity of choice, we will get .5% back in donations from Amazon on all purchased items. With the new video security system in place at Jefferson, PTA will be has a food donation drop off cart out at dropoff every morning to make donating easier!